Here at Pinecrest, we apply our unique knowledge and expertise for every project, building on 19 years of experience and research to make your image more attractive, durable and effective. We understand that your graphic image is the face that you show to the rest of the world. We will review for you the founding principles and priorities that drives your business and we will work with you to be able to execute your project properly, on time and in the limits of your budjet. A lot of businesses count on us for their signage needs. We use modern systems and the most recent techniques to create a sign that creates a big impact, for a good price, that will bring you results. On top of it all, we make the process simple for you. 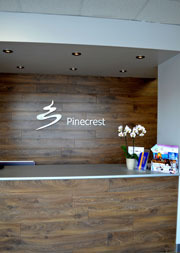 From start to finish, you can count on Pinecrest. Why should you choose Pinecrest? - During your consultation, you will have personalized and reliable services with experts in this field. We are qualified to indentify your needs and help you define the best solution for you to have more for your money. - It's easy for us to precisely reproduce your files and convert them with the help of our digital installations and the transfert of your files through our website. Further more, we archive all our files, and we take note of other specific information, wich will permit us to repeat an order without any problems by contacting us by phone, fax or e-mail. - We offer you a vast choice of products and services, including almost all kinds of signs, banners and supports. And we keep in inventory a big variety of high quality materials in a vast choice of colors, products and finishes.